Terry Goodkind's Sword of Truth novels set a new standard for epic storytelling in a fully-realized created world. Now Goodkind returns to that world for a new cycle of tales, focusing on Richard Cypher and Kahlan Amnell. Hidden deep underground for millennia, discovered by change, the mysterious machine has awakened, to begin issuing a series of ominous and alarmingly accurate omens. As the wizard Zeddicus attempts to destroy the sinister device, it issues a cataclysmic omen involving Richard and Kahlan, foretelling an impending event beyond anyone's ability to prevent it. With catastrophe imminent, the machine then reveals that it is within its power to withdraw the omen... on fulfillment of an impossible demand. I have fond (and some not so fond) memories of the Sword of Truth series. Some books were amazing and others didn’t quite satisfy. I grew attached to the characters and with the turn of that last page of Confessor I was left wondering what would happen next. Richard and Kahlan triumphed, but how will they handle their “happily ever after” life? What happens to the rest of the characters? Reading The Omen Machine was like running into some old friends after not seeing them for ages. They seem familiar, but after some time you realize that they aren’t quite the same as you remembered them. 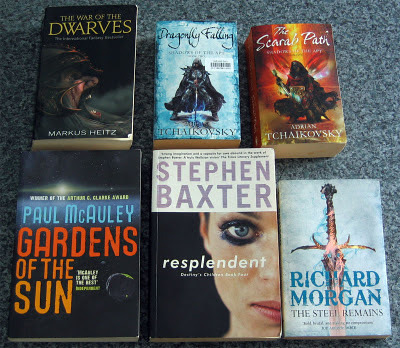 The supporting cast of Zedd, Cara, Nicci and Nathan feel like shadows of their former selves and even Kahlan and Richard are diminished in some way that’s hard to articulate sufficiently without doing a complete re-read of the series. The plot is pretty simplistic and relies far too much on coincidence to move events along. There are also quite a few inconsistencies and things that are left unexplained. For some reason the entire populace suddenly becomes fixated with following prophecy, something that didn’t even feature in the previous novels and the reason for this sudden fixation is never explained. On top of that people, both gifted and non-gifted, also start to have prophetic visions of their own leading them to kill their families in horrific ways in order to protect them from a horrible fate. These visions are apparently caused by the Omen Machine which is discovered later in the novel, but how and why this happens is left completely unexplored aside from Zedd suddenly and unaccountably stating that the machine is the cause. “… what had to be thousands of strips of cloth, string and thin vines all hanging from the ceiling, all holding objects tied to their ends, everything from coins to shells to rotting lizards” (p 342). “Kahlan passed through rooms with hundreds of strips of cloth hanging from the ceiling, each holding an object of some sort, everything from coins to the remains of small animals” (p 491). This repetition got on my nerves and at times I wished that he would just get on with the story already. There is a shining light though in the form of the truly creepy antagonist Jit, a Hedge Maid with occult powers, a penchant for drinking human blood and a weird sense of interior decorating (weaving people into walls!). The other villain (who shall remain unnamed to prevent a possible spoiler) is far less scary and his appearance feels like a clichéd caricature of what an evil character should look like. “The whites of the man’s eyes were not white. Not at all. They had been tattooed a bright blood red” (p 348). “Every bit [of his flesh] was covered with tattooed symbols. Not simply covered, but layered over countless times so that the skin looked something other than human” (p 349). The ending relies on one of those moments where Richard manages to pull a solution out of thin air to save the day. I still can’t figure out how he managed to decipher the last prophecy the machine gave him without having access to information that’s only revealed long after the fact. If you can look past this discrepancy the ending is satisfying in a way, but it leaves much unresolved. I’m sure we’ll be seeing another “Richard and Kahlan” novel sometime in the future. [Some Internet sleuthing seems to indicate that The Omen Machine is the first book in a new trilogy, but I can’t seem to find any definite confirmation of that fact]. Another major discrepancy I have to mention is that the synopsis used on the cover and in the promotional material doesn’t fit with the actual events of the story. The last paragraph, “With catastrophe imminent, the machine then reveals that it is within its power to withdraw the omen… on fulfillment of an impossible demand” just never happens. Since this is a serious hook to draw readers to the book I don’t know why it was included. Perhaps it was part of the story that got cut during editing and the synopsis never got corrected? One thing is certain, it’s seriously misleading and left me feeling cheated. 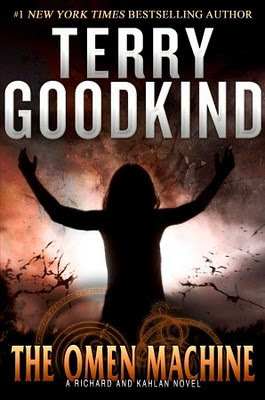 It was great to see all the familiar characters back in action, but The Omen Machine doesn’t feel quite up to the standards of Terry Goodkind’s other Sword of Truth novels, especially not the early works. The plot hinges on far too many coincidences and fantastical leaps in logic which are never quite explained to satisfaction. Though flawed The Omen Machine is still an enjoyable read for the most part, but I expected so much more from it based on what proved to be a misleading synopsis. The Third Kingdom, the sequel to the Omen Machine, is scheduled to be released in August 2013. 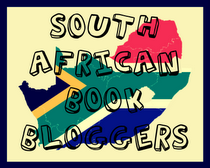 This is a new monthly feature where I'll highlight new or upcoming book releases which have caught my eye. Books might be included in the list based on their brilliant writing, a captivating premise, the continuation of an addictive series or something as simple as the magical lure of their cover art. This is by no means an exhaustive list and release dates are, as always, subject to change. 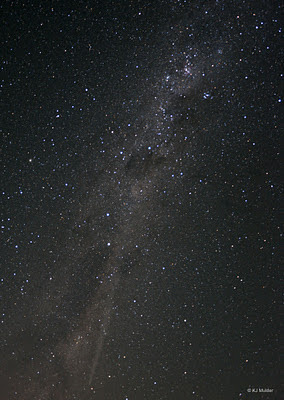 100,000 years ago, the galaxy was populated by a great variety of beings. 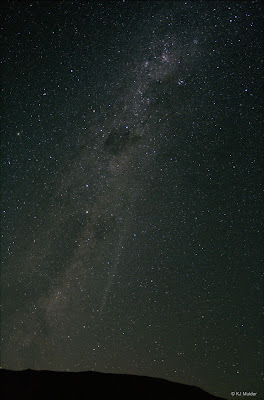 But one species - eons beyond all others in both technology and knowledge - achieved dominance. They ruled in peace but met opposition with quick and brutal effectiveness. 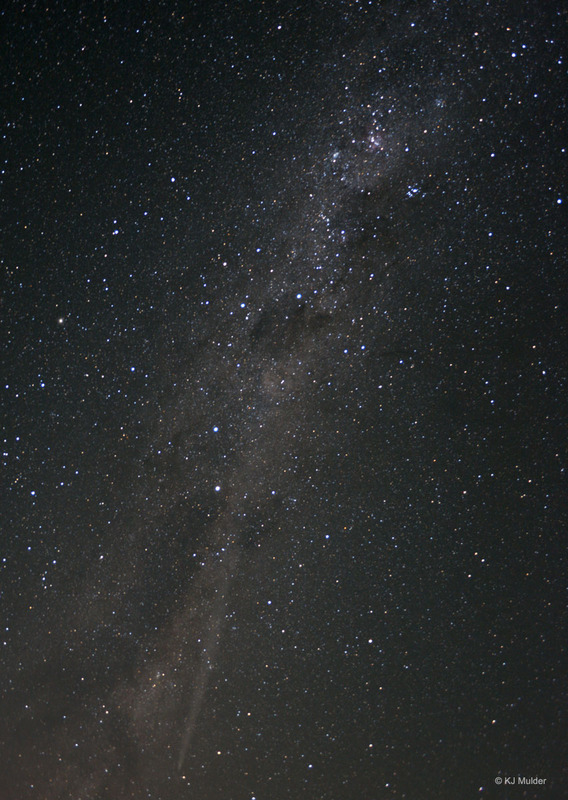 They were the Forerunners - the keepers of the Mantle, the next stage of life in the Universe’s Living Time. And then they vanished. This is their story. On a Lifeworker's experimental planet a young Forerunner's rebellious course crosses the paths of two humans, and the long lifeline of a great military leader, forever changing his destiny... and the fate of the entire galaxy. This is a tale of life, death, intergalactic horror, exile, and maturity. It is a story of overwhelming change - and of human origins. For the mantle of shepherds and caretakers of all life many not lie upon the shoulders of Forerunners forever. I’m always weary when it comes to tie-in novels especially when I’m not too familiar with the franchise. Aside from a vague memory of playing (and enjoying) the first Halo game when it was ported to the PC in 2003 I’m a complete neophyte when it comes to the Halo universe. 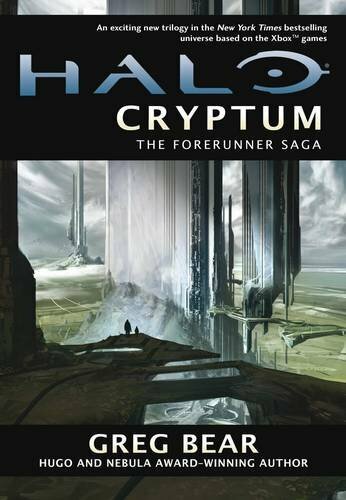 I didn’t quite know what to expect from Halo: Cryptum the first book in the Forerunner Saga which is set approximately 100,000 years before the events in the game. 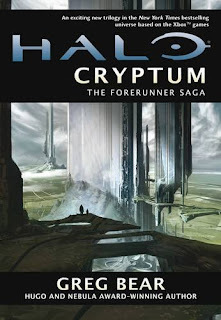 Halo: Cryptum tells the story of the Forerunners and reveals the origins of the Halo structures as well as a surprising connection between the human race and the Forerunners. The story is told from the perspective of a young Forerunner named Bornstellar Makes Eternal Lasting (Born for short) and revolves around his journey into adulthood while he gets entangled in the events that will eventually lead to the disappearance of the entire Forerunner race. Halo: Cryptum is a character-driven story that relies more on narrative than action to explore life in Forerunner society as their race reaches a turning point while having to face their greatest peril. I enjoyed the coming of age story of Bornstellar as he is forced to grow up. His journey is not an easy one, but he still faces it with courage and a distinctive determination. There is one very poignant moment when he finally comprehends the impact of what the Forerunners had done to ensure their dominance in the galaxy. At that moment he realizes that his life is forever altered and that he can never return to his childhood innocence no matter how strongly he yearns for it. Bornstellar’s two human companions, Chakas and Riser, also undergo tremendous personal changes especially when they are faced with the reality of what has been done to them and what their race has lost at the hands of the Forerunners. Since this is the first novel in the Forerunner saga it’s largely used to lay the groundwork for the rest of the novels. Things started off quite slowly, but the pace picks up nicely as the story progresses. There are lots of startling revelations along the way and the twist at the end caught me entirely by surprise. I can’t wait to get my hands on Halo: Primordium to see what happens next. I enjoyed Halo: Cryptum far more than I expected. The writing is well done and the Halo universe makes for a vibrant and captivating setting. This would be a great starting point for newcomers since it’s essentially the story of how it all began. Long-time Halo fans won’t be disappointed either and will finally get some answers to lots of burning questions. Definitely recommended! This week I received some books I ordered from Awesomebooks.com in mid December. I was surprised that they got here in just a little over 17 business days. I was expecting a much longer wait since international post tends to take so much longer over the Christmas period due to all those public holidays and increased package volumes. The War of the Dwarves by Markus Heitz. I need to catch up to the rest of this series in order to be able to review the latest release Revenge of the Dwarves which I received for review last year. 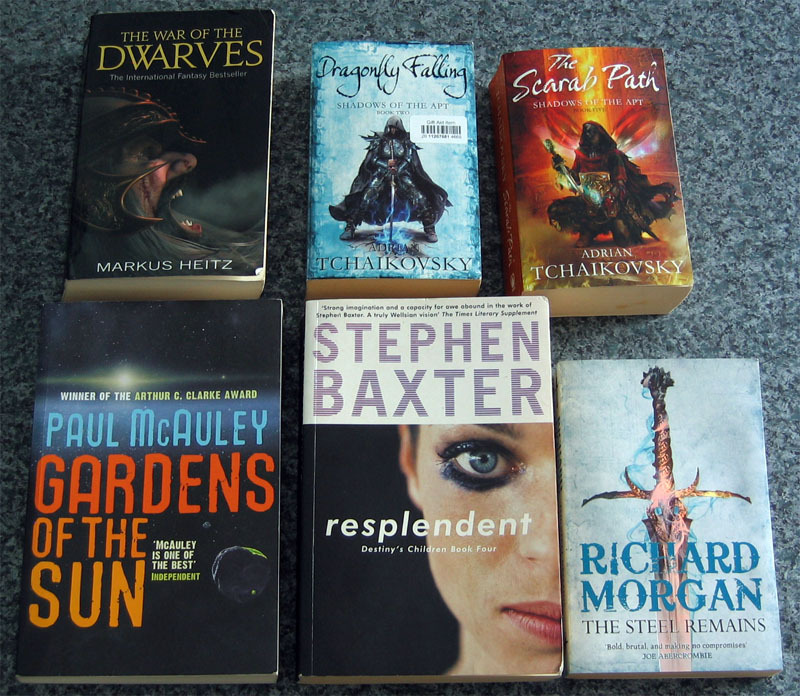 These are tomes, so don't expect a review anytime soon. Dragonfly Falling and The Scarab Path by Adrian Tchaikovsky. These are also books I ordered so I can catch up with the series. I still need to find copies of books 3, 4 and 5 before I can start on these. The Steel Remains by Richard Morgan. This book has an absolutely gorgeous cover which the photo doesn't do any justice at all. The sword shimmers in mesmerizing colors and is stunning to look at. Gardens of the Sun by Paul McAuley. As a Christmas present to myself I ordered a new ebook reader as a companion to my aging Cybook Opus. After countless feature comparisons and deep contemplation I settled on the Sony PRS-T1 a.k.a. 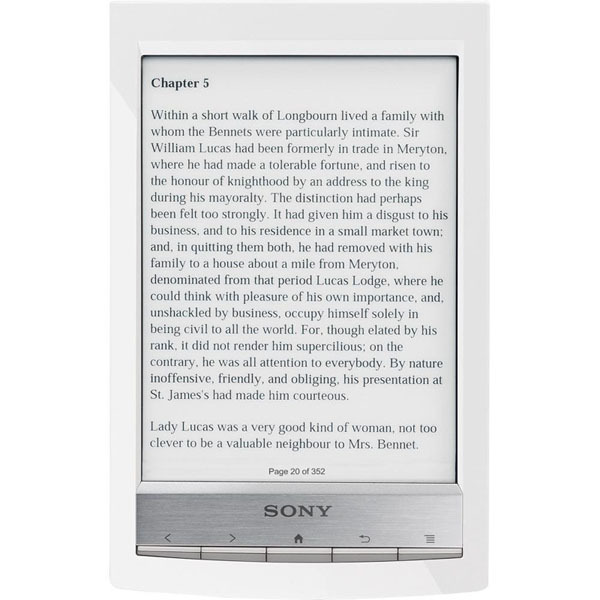 the Sony Reader Wi-Fi. Sony doesn't view South Africa as a viable market for their eReaders so I was forced to order this from the US via an import service. Luckily Sony had a special on the T1s during December so in the end everything worked out for the best and I got mine for less than the Kindle Touch would have cost. I've only had it for a day, but so far I'm very happy with it. Initially I expected a much better improvement in screen quality over my Opus, but all the extra features and ease of use made up for that slight disappointment. I prefer the general looks of the T1 over the Kindle and it sits very comfortably in my hands. The user interface is very easy to use and I like the fact that they've included physical buttons in addition to the touch capability. 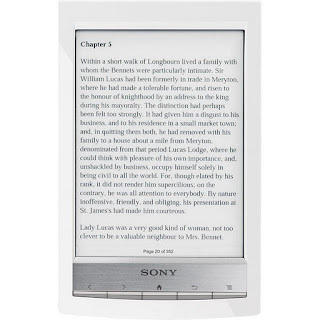 I noticed that The Book Depository is also selling the Sony PRS-T1 eReaders. If, like me, you live in country where the PRS-T1 isn't available locally they might be a good option since their free international shipping applies to the eReaders as well. 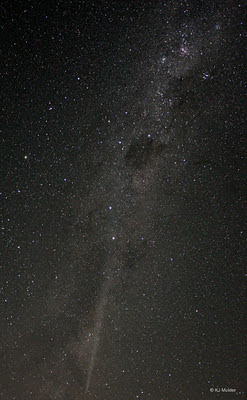 I can't believe that we are already well into 2012. Time really flies when you are having fun (or immersed in fictional worlds!). 2011 was a great year for me. I read some stunning books, met some amazing people and managed to get far more reviews done than I would ever have expected. My goal for 2011 was to read more than 100 books and reach a total of 50,000 pages read. My final count for the year was 122 books, but my page total only came to 49,571 pages. The problem with counting pages is that there really isn't a standard to adhere to. The different formats all have different page counts and font sizes. I think if I convert the hardcover and trade paperback page counts to their mass market equivalents I'd be well above the 50,000 mark so I'm chalking this one up as a success. For 2012 I'm going to take a more leisurely approach to my reading. My only goal for 2012 will be to see how many books I can read. I'm hoping for 125 books, but I'll have to see how it goes. Here's to a great 2012 filled with loads of books and, more importantly, the time to read them! 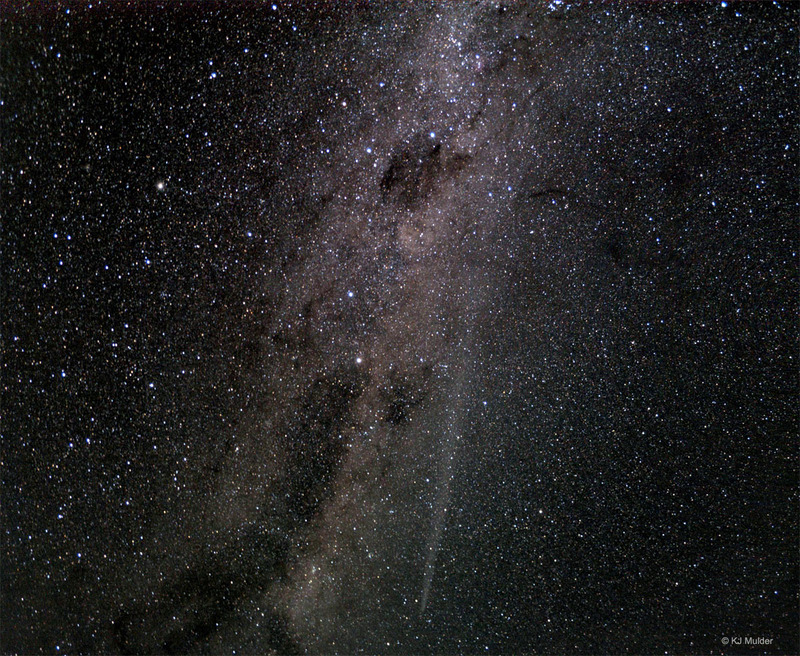 Comet Lovejoy is fading fast and is becoming much more difficult to see with the naked eye. 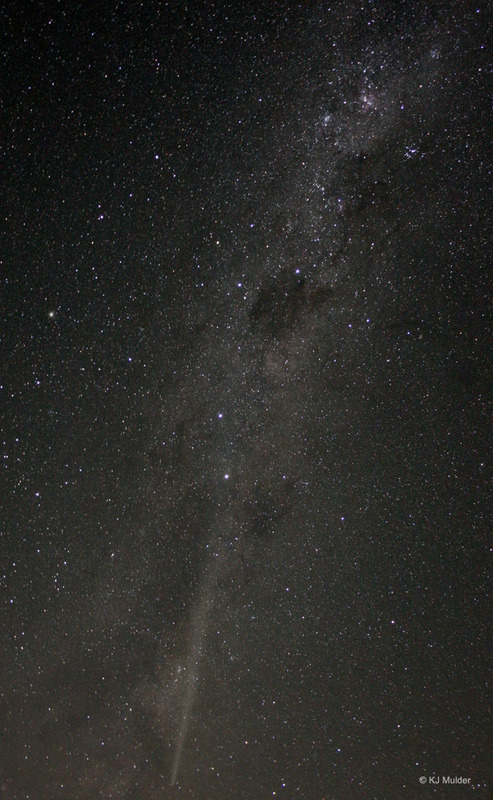 Aside from the 30th December when windy conditions (and exhaustion) prevented me from going out I was lucky enough to be able to image Lovejoy for most of the weekend. If conditions allow I'm hoping to get at least another couple of sessions in, especially when Lovejoy nears the South Celestial Pole which will allow for longer untracked exposures.